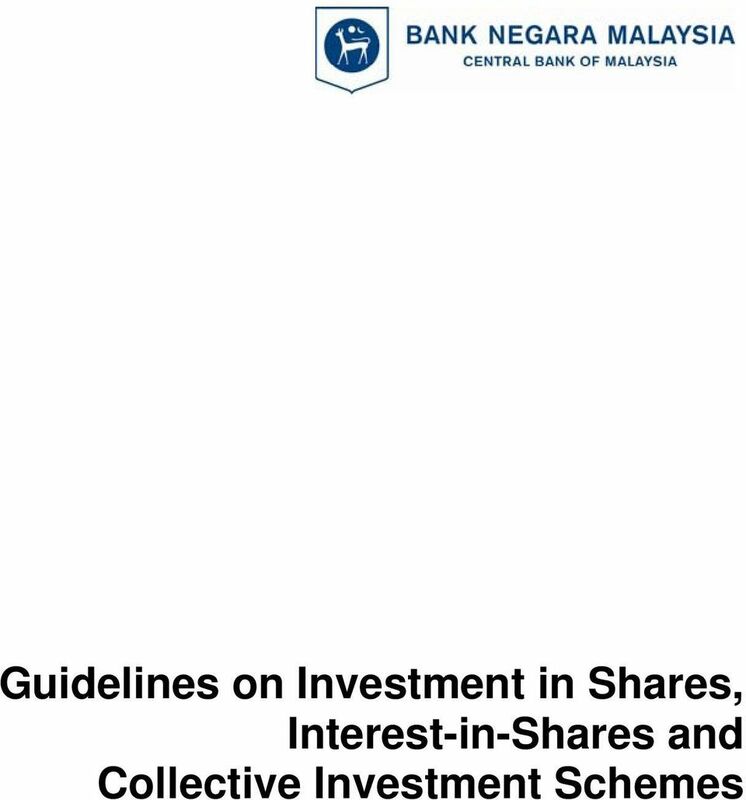 Download "Guidelines on Investment in Shares, Interest-in-Shares and Collective Investment Schemes"
5 Page 3/14 BAFIA. 4. Scope of Guidelines 4.1. 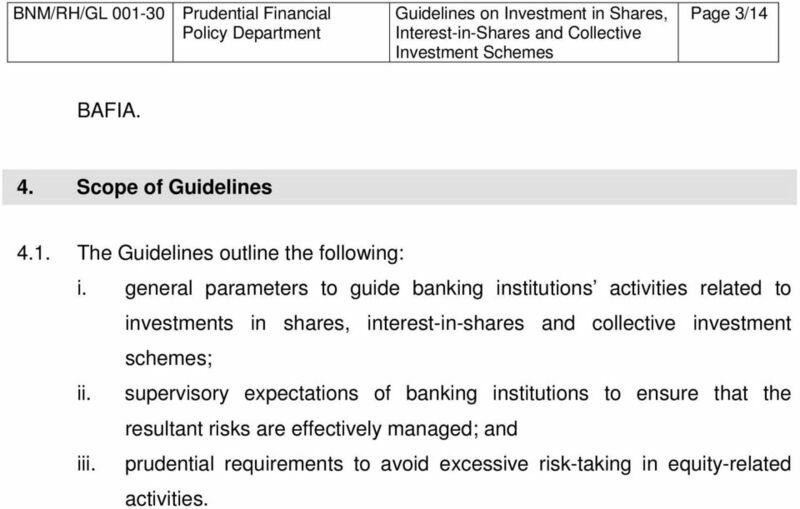 The Guidelines outline the following: i. general parameters to guide banking institutions activities related to investments in shares, interest-in-shares and collective investment schemes; ii. supervisory expectations of banking institutions to ensure that the resultant risks are effectively managed; and iii. 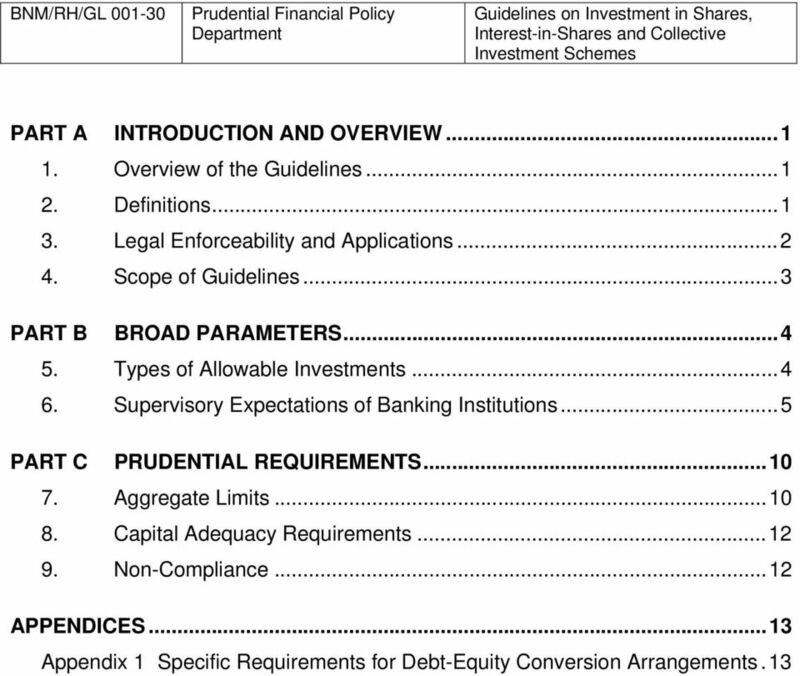 prudential requirements to avoid excessive risk-taking in equity-related activities. 6 Page 4/14 PART B BROAD PARAMETERS 5. Types of Allowable Investments 5.1. 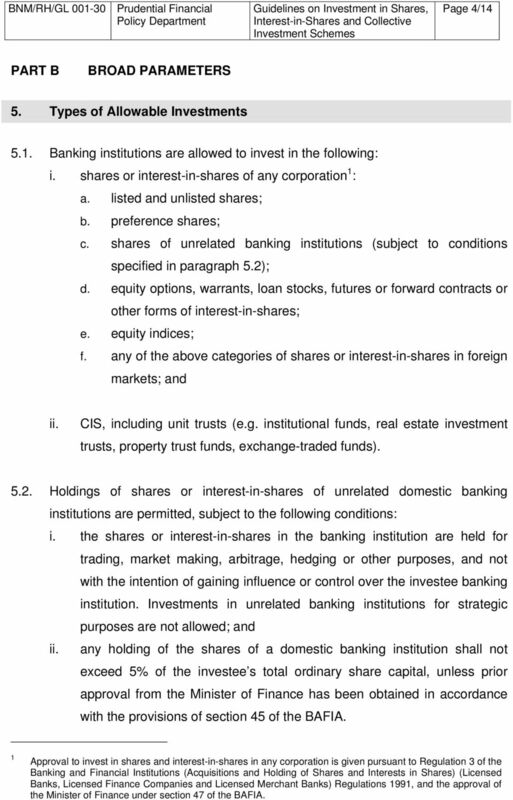 Banking institutions are allowed to invest in the following: i. shares or interest-in-shares of any corporation 1 : a. listed and unlisted shares; b. preference shares; c. shares of unrelated banking institutions (subject to conditions specified in paragraph 5.2); d. equity options, warrants, loan stocks, futures or forward contracts or other forms of interest-in-shares; e. equity indices; f. any of the above categories of shares or interest-in-shares in foreign markets; and ii. CIS, including unit trusts (e.g. institutional funds, real estate investment trusts, property trust funds, exchange-traded funds) Holdings of shares or interest-in-shares of unrelated domestic banking institutions are permitted, subject to the following conditions: i. the shares or interest-in-shares in the banking institution are held for trading, market making, arbitrage, hedging or other purposes, and not with the intention of gaining influence or control over the investee banking institution. Investments in unrelated banking institutions for strategic purposes are not allowed; and ii. any holding of the shares of a domestic banking institution shall not exceed 5% of the investee s total ordinary share capital, unless prior approval from the Minister of Finance has been obtained in accordance with the provisions of section 45 of the BAFIA. 1 Approval to invest in shares and interest-in-shares in any corporation is given pursuant to Regulation 3 of the Banking and Financial Institutions (Acquisitions and Holding of Shares and Interests in Shares) (Licensed Banks, Licensed Finance Companies and Licensed Merchant Banks) Regulations 1991, and the approval of the Minister of Finance under section 47 of the BAFIA. 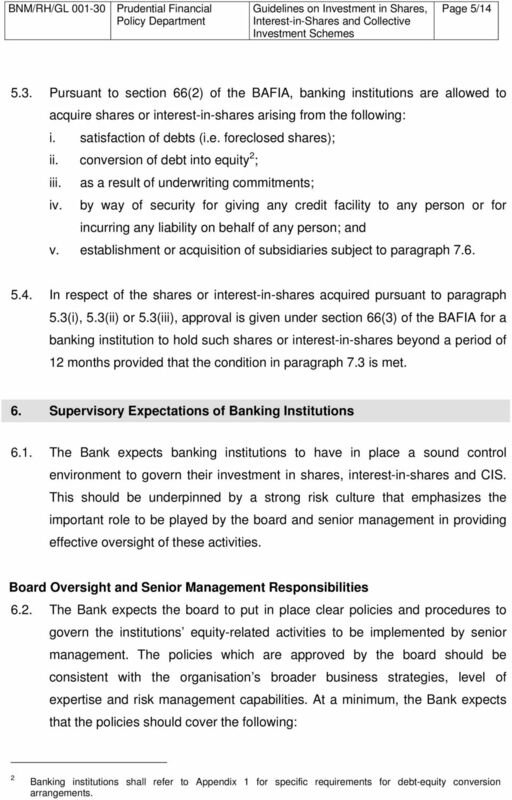 7 Page 5/ Pursuant to section 66(2) of the BAFIA, banking institutions are allowed to acquire shares or interest-in-shares arising from the following: i. satisfaction of debts (i.e. foreclosed shares); ii. conversion of debt into equity 2 ; iii. as a result of underwriting commitments; iv. by way of security for giving any credit facility to any person or for incurring any liability on behalf of any person; and v. establishment or acquisition of subsidiaries subject to paragraph In respect of the shares or interest-in-shares acquired pursuant to paragraph 5.3(i), 5.3(ii) or 5.3(iii), approval is given under section 66(3) of the BAFIA for a banking institution to hold such shares or interest-in-shares beyond a period of 12 months provided that the condition in paragraph 7.3 is met. 6. Supervisory Expectations of Banking Institutions 6.1. The Bank expects banking institutions to have in place a sound control environment to govern their investment in shares, interest-in-shares and CIS. This should be underpinned by a strong risk culture that emphasizes the important role to be played by the board and senior management in providing effective oversight of these activities. Board Oversight and Senior Management Responsibilities 6.2. The Bank expects the board to put in place clear policies and procedures to govern the institutions equity-related activities to be implemented by senior management. The policies which are approved by the board should be consistent with the organisation s broader business strategies, level of expertise and risk management capabilities. 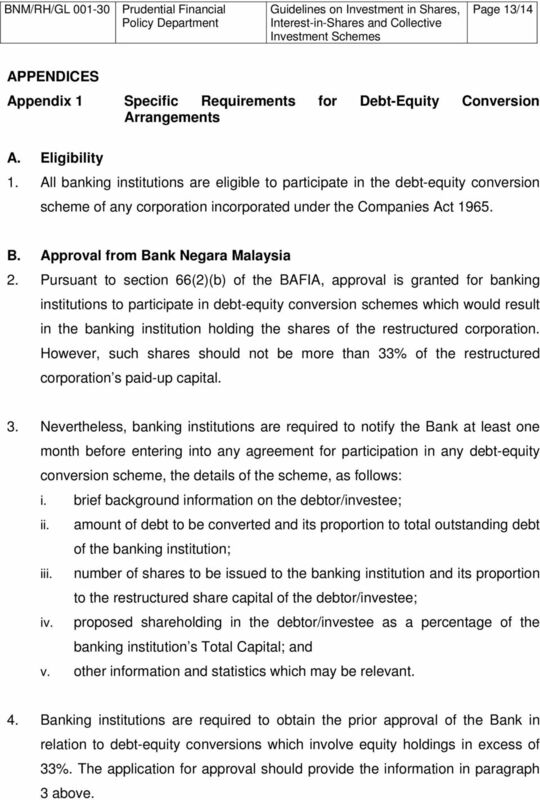 At a minimum, the Bank expects that the policies should cover the following: 2 Banking institutions shall refer to Appendix 1 for specific requirements for debt-equity conversion arrangements. 8 Page 6/14 i. allowable investments for the institution covering; a. purpose of transactions (e.g. for trading, hedging or investment purpose); b. types of instruments (e.g. ordinary shares, preference shares, unlisted shares, unit trust funds); c. types of issuers (e.g. minimum quality or rating of issuer); d. target liquidity and duration of the investment portfolio (e.g. setting the minimum and maximum duration), having regard to its investment strategies and desired returns; e. allowable markets for investments. The policies on allowable markets should reflect the management s views on the relative riskiness of various market segments which will guide or set the boundaries for which relevant parties within the banking institution can develop suitable investment or product strategies. Such risk analysis should be documented and updated to reflect the prevailing macro-economic environment and possible future scenarios. For equities listed in stock exchanges, due consideration should also be given to the operation of circuit breaker mechanisms or other control features within the stock exchanges to manage extreme market volatilities. ii. iii. 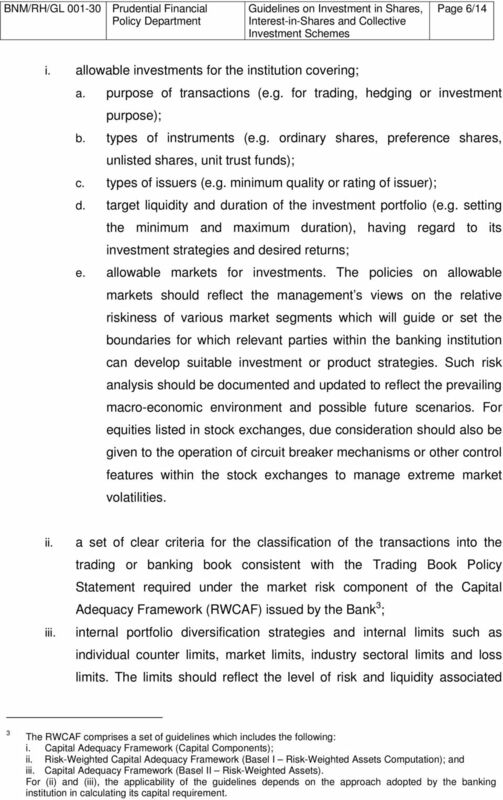 a set of clear criteria for the classification of the transactions into the trading or banking book consistent with the Trading Book Policy Statement required under the market risk component of the Capital Adequacy Framework (RWCAF) issued by the Bank 3 ; internal portfolio diversification strategies and internal limits such as individual counter limits, market limits, industry sectoral limits and loss limits. 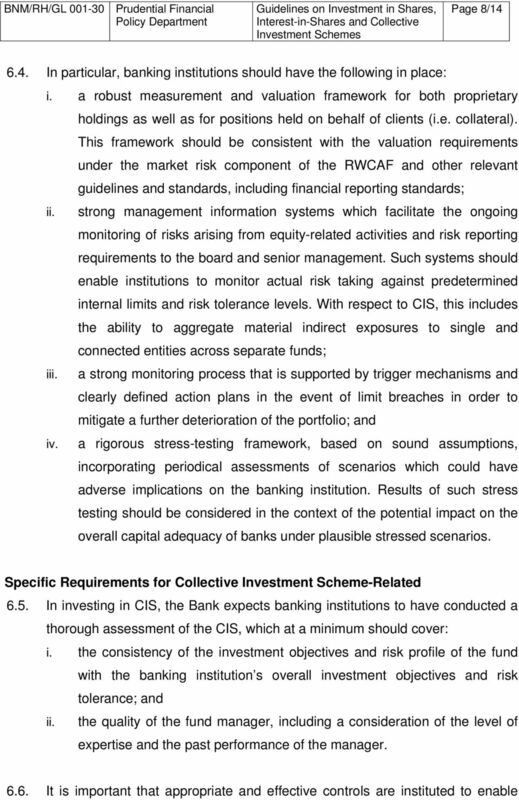 The limits should reflect the level of risk and liquidity associated 3 The RWCAF comprises a set of guidelines which includes the following: i. Capital Adequacy Framework (Capital Components); ii. Risk-Weighted Capital Adequacy Framework (Basel I Risk-Weighted Assets Computation); and iii. Capital Adequacy Framework (Basel II Risk-Weighted Assets). For (ii) and (iii), the applicability of the guidelines depends on the approach adopted by the banking institution in calculating its capital requirement. 9 Page 7/14 with particular shares, markets or sectors; iv. clear lines of responsibility with effective reporting procedures. The policies should clearly indicate the decision-making authority and approval process, for new investments and limit overrides; and v. clearly defined responsibilities of internal audit in assessing the effectiveness of the internal control systems put in place to control risk taking. This should include independent assessments by internal audit of the following: a. state of the banking institution s compliance with investment policies and limits; and b. the adequacy of the processes established to ensure adherence to policies and procedures set by the board and senior management, including reporting structures. The Bank expects the internal audit to undertake an assessment of the banking institution s control environment periodically and report its assessment to senior management and the board, together with recommendations to enhance the control procedures. The board and senior management should ensure that audit findings and recommendations are promptly acted on. Risk Management Processes and Infrastructure 6.3. 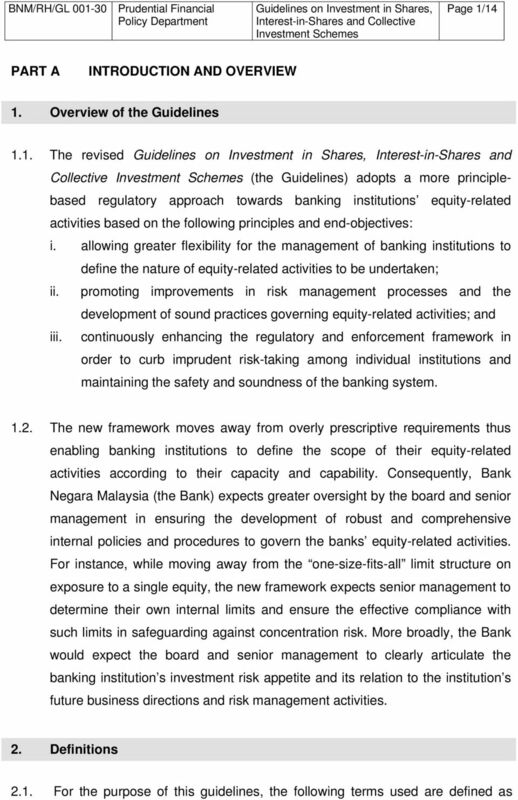 To support the equity-related activities undertaken by banking institutions, the Bank expects that institutions have appropriate risk management processes and infrastructure in place that are consistent with sound risk management principles established under relevant guidelines issued by the Bank. The board and senior management have the responsibility to ensure that robust processes and systems are put in place such that all material risks are clearly identified, measured and monitored to enable sound investment decisions and avoid excessive risk exposures to equity positions. 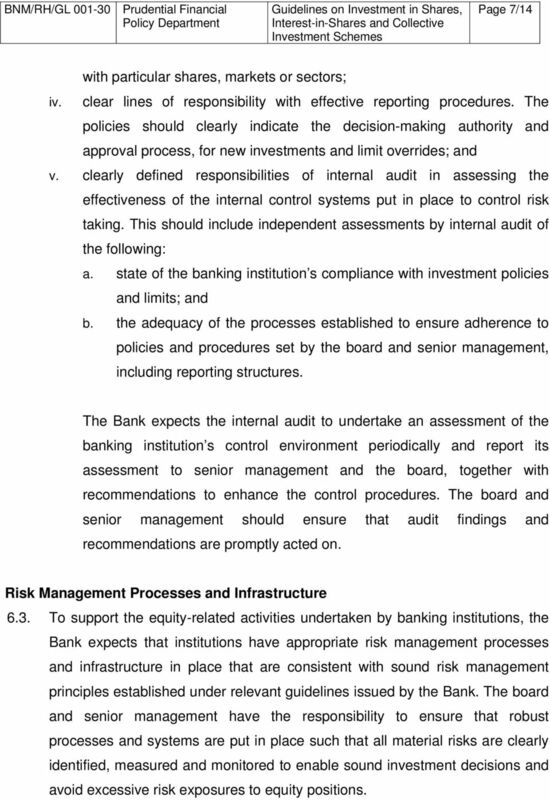 11 Page 9/14 banking institutions to continually assess that the investments are conducted in a manner that is consistent with the banking institution s broader business strategies and within the boundaries defined by its risk management framework. This includes ensuring that fund managers provide adequate reports to banking institutions: i. on underlying investments, the extent of leverage and fund performance of individual CIS on a periodic basis; and ii. whenever there are any material changes to the way the fund is managed, which could invalidate the suitability of investing in the CIS Banking institutions should also assess and manage the risks associated with sponsorships of CIS appropriately. Such sponsorships may take place directly, through injections of seed capital into funds or the provision of liquidity support facilities. 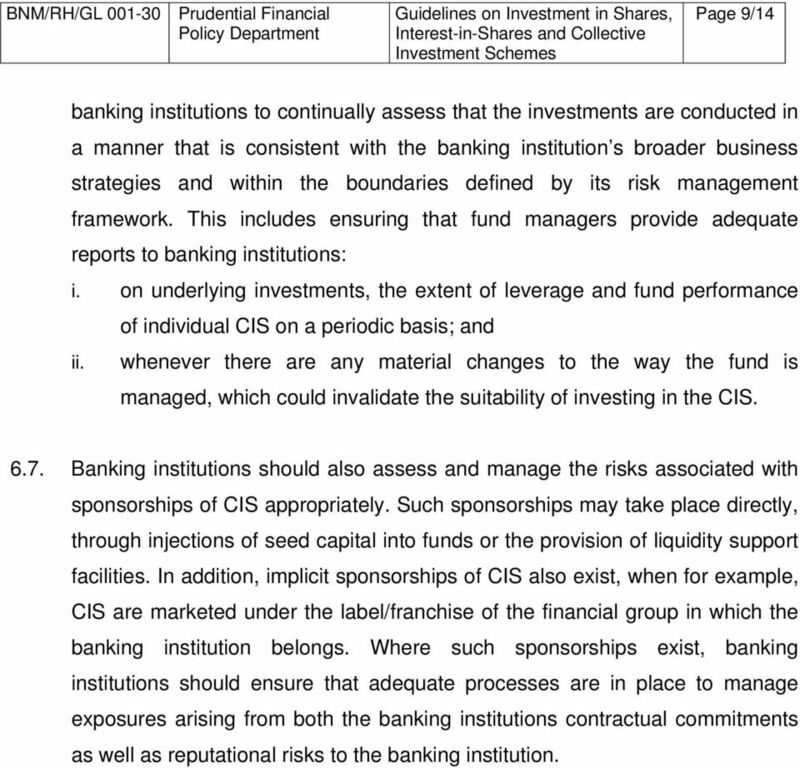 In addition, implicit sponsorships of CIS also exist, when for example, CIS are marketed under the label/franchise of the financial group in which the banking institution belongs. Where such sponsorships exist, banking institutions should ensure that adequate processes are in place to manage exposures arising from both the banking institutions contractual commitments as well as reputational risks to the banking institution. 12 Page 10/14 PART C PRUDENTIAL REQUIREMENTS 7. Aggregate Limits 7.1. A banking institution s investments in shares, interest-in-shares and CIS shall be subject to the following limits: i. the aggregate book value of investments in shares 4, interest-in-shares, CIS and immovable properties shall not exceed 50% of the banking institution s Total Capital; and ii. 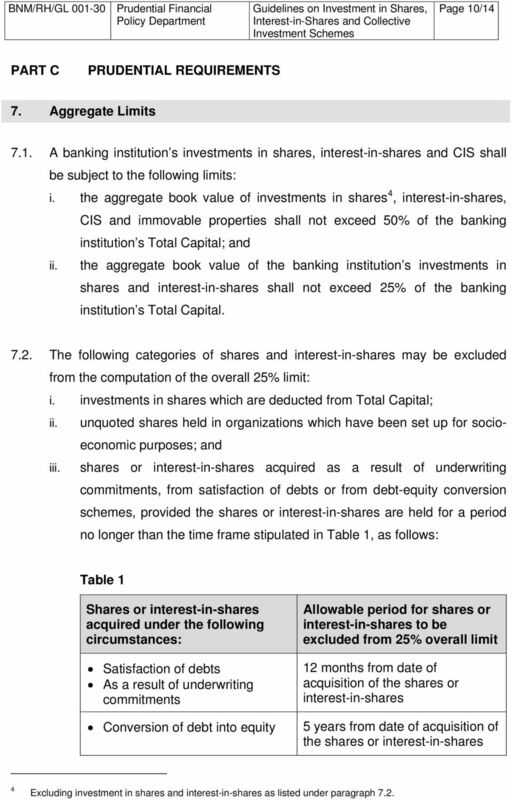 the aggregate book value of the banking institution s investments in shares and interest-in-shares shall not exceed 25% of the banking institution s Total Capital The following categories of shares and interest-in-shares may be excluded from the computation of the overall 25% limit: i. investments in shares which are deducted from Total Capital; ii. unquoted shares held in organizations which have been set up for socioeconomic purposes; and iii. 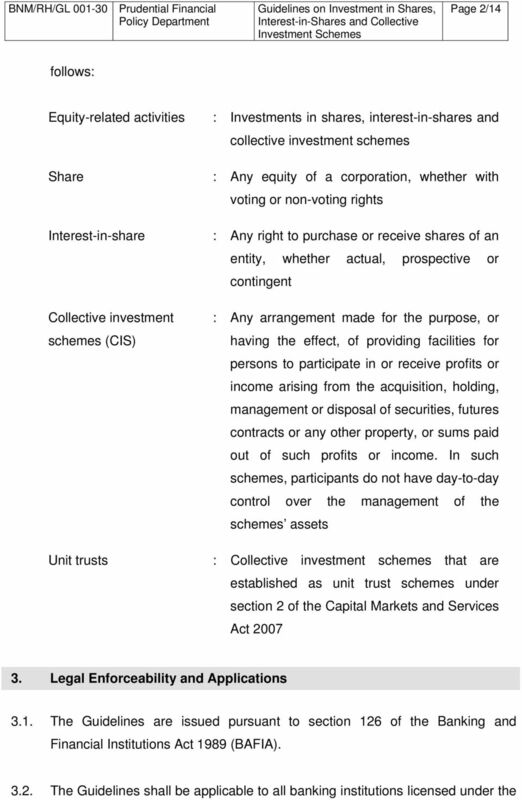 shares or interest-in-shares acquired as a result of underwriting commitments, from satisfaction of debts or from debt-equity conversion schemes, provided the shares or interest-in-shares are held for a period no longer than the time frame stipulated in Table 1, as follows: Table 1 Shares or interest-in-shares acquired under the following circumstances: Satisfaction of debts As a result of underwriting commitments Conversion of debt into equity Allowable period for shares or interest-in-shares to be excluded from 25% overall limit 12 months from date of acquisition of the shares or interest-in-shares 5 years from date of acquisition of the shares or interest-in-shares 4 Excluding investment in shares and interest-in-shares as listed under paragraph 7.2. 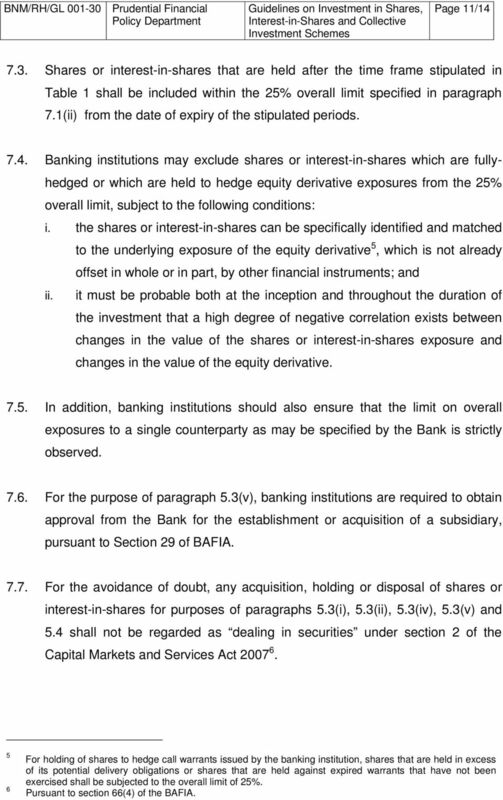 13 Page 11/ Shares or interest-in-shares that are held after the time frame stipulated in Table 1 shall be included within the 25% overall limit specified in paragraph 7.1(ii) from the date of expiry of the stipulated periods Banking institutions may exclude shares or interest-in-shares which are fullyhedged or which are held to hedge equity derivative exposures from the 25% overall limit, subject to the following conditions: i. the shares or interest-in-shares can be specifically identified and matched to the underlying exposure of the equity derivative 5, which is not already offset in whole or in part, by other financial instruments; and ii. it must be probable both at the inception and throughout the duration of the investment that a high degree of negative correlation exists between changes in the value of the shares or interest-in-shares exposure and changes in the value of the equity derivative In addition, banking institutions should also ensure that the limit on overall exposures to a single counterparty as may be specified by the Bank is strictly observed For the purpose of paragraph 5.3(v), banking institutions are required to obtain approval from the Bank for the establishment or acquisition of a subsidiary, pursuant to Section 29 of BAFIA For the avoidance of doubt, any acquisition, holding or disposal of shares or interest-in-shares for purposes of paragraphs 5.3(i), 5.3(ii), 5.3(iv), 5.3(v) and 5.4 shall not be regarded as dealing in securities under section 2 of the Capital Markets and Services Act For holding of shares to hedge call warrants issued by the banking institution, shares that are held in excess of its potential delivery obligations or shares that are held against expired warrants that have not been exercised shall be subjected to the overall limit of 25%. Pursuant to section 66(4) of the BAFIA. 14 Page 12/14 8. Capital Adequacy Requirements Market and Credit Risk 8.1. All equity positions shall be classified in either the trading or banking book based on the banking institution s intention in undertaking the investment and other considerations which have been specified in the RWCAF. Accordingly, banking institutions shall apply the appropriate capital adequacy treatment for the holding of equities as prescribed under the RWCAF Large Exposure Risk Requirements 8.2. A capital charge for Large Exposure Risk Requirements (LERR) shall be applied to ensure banks that have substantial exposures to a single counter are sufficiently capitalized to mitigate any adverse movement in the price of the particular counter. 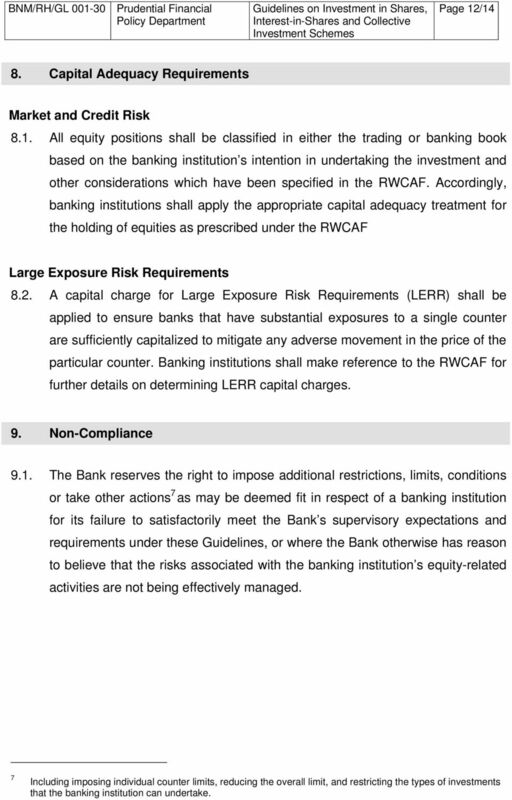 Banking institutions shall make reference to the RWCAF for further details on determining LERR capital charges. 9. Non-Compliance 9.1. The Bank reserves the right to impose additional restrictions, limits, conditions or take other actions 7 as may be deemed fit in respect of a banking institution for its failure to satisfactorily meet the Bank s supervisory expectations and requirements under these Guidelines, or where the Bank otherwise has reason to believe that the risks associated with the banking institution s equity-related activities are not being effectively managed. 7 Including imposing individual counter limits, reducing the overall limit, and restricting the types of investments that the banking institution can undertake. 15 Page 13/14 APPENDICES Appendix 1 Specific Requirements for Debt-Equity Conversion Arrangements A. Eligibility 1. All banking institutions are eligible to participate in the debt-equity conversion scheme of any corporation incorporated under the Companies Act B. Approval from Bank Negara Malaysia 2. 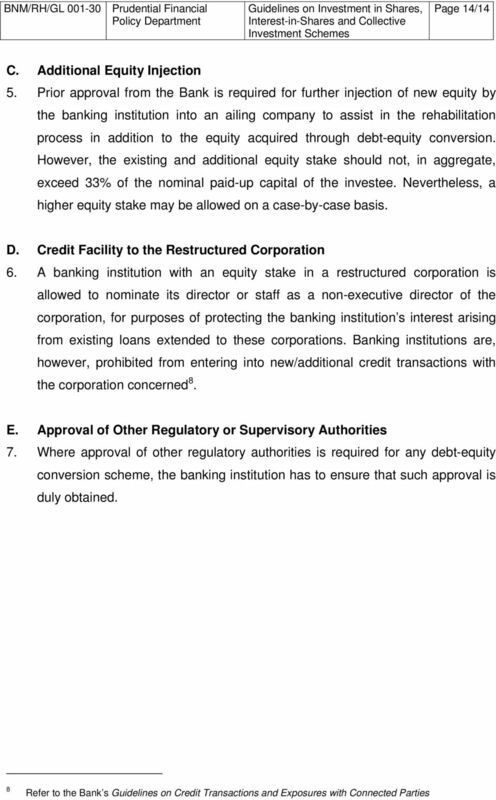 Pursuant to section 66(2)(b) of the BAFIA, approval is granted for banking institutions to participate in debt-equity conversion schemes which would result in the banking institution holding the shares of the restructured corporation. However, such shares should not be more than 33% of the restructured corporation s paid-up capital. 3. Nevertheless, banking institutions are required to notify the Bank at least one month before entering into any agreement for participation in any debt-equity conversion scheme, the details of the scheme, as follows: i. brief background information on the debtor/investee; ii. amount of debt to be converted and its proportion to total outstanding debt of the banking institution; iii. number of shares to be issued to the banking institution and its proportion to the restructured share capital of the debtor/investee; iv. proposed shareholding in the debtor/investee as a percentage of the banking institution s Total Capital; and v. other information and statistics which may be relevant. 4. Banking institutions are required to obtain the prior approval of the Bank in relation to debt-equity conversions which involve equity holdings in excess of 33%. The application for approval should provide the information in paragraph 3 above.